You definitely look like you need a holiday! So why not spoil yourself and visit sunny Cape Town in the Western Cape. There are literally 100's of incredible activities and things to see and do here that you will not be bored for 1 moment. From - Safaris, Whale watching, Wine Tours, miles of empty sandy beaches and for those wanting full-on action - there is Great White Shark cage diving. So you’ve just arrived in Cape Town – the Mother City – to be greeted by your friendly and informative Chauffeur Tour Guide from Percy Tours & whisked off to the V&A Waterfront for some cool shopping for art, crafts, boutique gifts, diamonds & jewellery and craft markets - while there are also fabulous things to see and do - 2 Oceans Aquariums, open air concerts, restaurants, Robben Island tours and sun-downer boat cruises into the bay. After all these possibilities, Percy Tours will whisk you off to the helicopter pad conveniently located in the Waterfront for a scenic flight, encompassing Devils Peak – where, rumour has it that an old man would sit smoking his pipe & creating the fabled table cloth of cloud over the beautiful Table Mountain – the city bowl & Lions Head with Signal Hill & the Noon Gun at the foot of Signal Hill. Upon landing its time for a sun-downer drink to watch the sun slowly descend into the ocean. So now you’ve relaxed & the sunset has mesmerized you with its beauty… it's time to get moving. So you get very comfortable in your personalized luxury minibus & it's off to the hotel for your first night in the beauty of the South Africa. If you are feeling like a bit of crazy night life, we will show you the vibe of the cosmopolitan Long Street, with outstanding cuisine & an adventure for your taste buds. You could dine on Cuban, African, Jamaican, Sushi, Moroccan, Cape Malay, Indian, Vietnamese, Thai & then night-clubs, bars & pool halls to entertain you. The next morning after a scrumptious breakfast, Percy Tours will take you to the foot of the Table Mountain for the cable car ride to the summit and a guided tour on top of this wonder of the natural world. There will be an opportunity for you to abseil off this awesome summit – 1000 meters of vertical rock, with your pulse racing, this is not for the faint hearted. From the summit you will be able to take in the full view of Table Bay, Robben Island, Milnerton, Blouberstrand (Blue Mountain Beach) to the North. Turn slowly to your left & take a peek to the south east for a breath-taking view of the beaches of Camps Bay, Bantry Bay, Green & Sea Points, Bakoven, City Bowl, Clifton & Llundudno in the distance. The Twelve Apostles to your extreme left are the silent sentinels looking over the Cape Riviera. The restaurant at the top will cater to all your needs, as well as any souvenirs you may wish to buy. Cape Town has a plethora of activities to offer, but 1 day trip you must do is to visit Cape Point Nature Reserve and Cape of Good Hope via the scenic Chapman’s Peak Drive & Noordhoek (beach horse riding) along the coast. Kirstenbosch Botanical Gardens, Boulders Beach & the penguins, Simonstown, Fish Hoek, Clovelly, Kalk Bay & Muizenberg. From here we will take the coast road to Hermanus. We’ll be passing through Gordons Bay, Pringle Bay, Betty’s Bay and Kleinmond, with the Kogelberg mountains dwarfing us as we wind our way along this magical ocean road. Stellenbosch – famous for its world renowned wines & vineyards – is a must see with a full days wine tasting set in outstanding beautiful landscapes. With over 300 wine estates, you are spoilt for choice, however Percy Tours does have some favorites to introduce you to - including excellent champagnes (MCC), red wines with chocolates, olives, biltong and nuts, ports, sherry, grappa, dessert wines and many more fine liquors. All of these farms will arrange for your purchases to be sent home for you at a small cost. 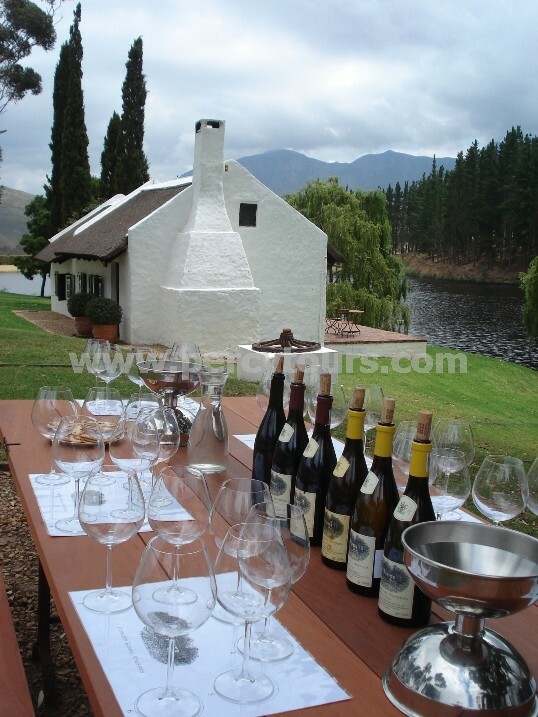 Franschhoek lies slightly to the east & also boasts some of the top 5 wine farms in the world. Percy Tours will then take you on another inspiring drive through the Franschhoek mountain range & the Hottentots Holland Nature Reserve passing through some quaint towns back to Hermanus. If altitude is your thing, a hot air balloon flight can be arranged over the vineyards with some stunning all round views. Once in the pretty coastal town of Hermanus, you are now at the epicentre of action in the Western Cape. From here all is possible. Great White Shark Cage Diving in Gansbaai & Kleinbaai, boat & land based Whale watching (Southern Right Whales / Eubalaena Australis), dolphins, Bryde's whales, seals & friendly penguins. Diving with sharks is completely safe from the cage & you are likely to have your heart bursting from your chest, as 5 metre creatures from the deep slide by your cage & if your hands were shaking too much to use your camera, then Percy Tours will help you with a fantastic DVD of the entire experience – an excellent investment for your grandchildren. This is the only place in the world where cage diving with Great White Sharks (Carcharodon Carcharias) is possible. An early meeting the next day at the Old Harbour to embark on your Kayaking trip, for a morning paddle on the sea; seals, whales, dolphins & penguin are regularly sighted on these trips so be sure to bring a waterproof camera along with you. The rest of the day is an opportunity to visit the award winning wine farms of the Hermanus wine valley of Hemel–en–Aarde Valley. Creation, Sumaridge, Bouchard-Finlayson, Newton Johnson & Hamilton Russell, with lunch at La Vierge. Close by, in the village of Stanford, you can visit the Birkenhead Brewery to sample unique micro-brewery beers – named after the HMS Birkenhead that sank off the coast here in 1852 killing all 450 soldiers on board, while all women & children were survived. This was the ship that pioneered the famous saying “women & children first”! Hermanus has much to offer in the form of - Quad biking, Tree Top zip-lining, Cessna plane flights over the whales and ocean scenery, Paragliding, Sandboarding, Rotary Way scenic drive, Horse riding either in the mountains or along the beaches, Scuba diving, Fernkloof flower gardens, art galleries, African art market, Hiking including our 15kms long cliff paths, Museums, Township Tours, Surfing, Bird Watching, Boat cruises on the sea or rivers and fabulous sandy beaches......clearly you are not likely to get bored! Some 125 kilometres south east of Hermanus, is the Southern Tip of Africa, at Cape Agulhas. So if you’ve ever had the urge to stand at the tip of a continent then this is the place for you. The closest southerly landmass is Antarctica – we don’t recommend that you try to swim it! A drive along the Garden Route will bring us thro' towns such as Swellendam, Riversdale, Mossel Bay, George, Wilderness, Oudtshoorn, Knysna, Plettenberg Bay and Tsitsikamma, with the highest bridge Bungee Jump in the world at 216 meters of sheer terror on the end of a rope. Skydiving, Waterfall zip-lining, Tree-cutters tour thro' the forests, Monkeyland, Birds of Eden, Elephant park, African cats, black water tubing, fantastic coastal hiking at Robberg Peninsula, Storms River and Natures Valley also await you. Travelling north, we will journey thro' Oudtshoorn to visit and explore the Cango Caves, Ostrich farms (where you can ride them), Karoo wine estates, Cango wildlife park for interactions with many creatures and then zip along the fantastically pretty Route 62, thro' Calitzdorp, Ladysmith, Barrydale and Montagu - where there is a large 54,000 hectare 5 star Safari park, to view African animals roaming free and over-night in the peaceful Karoo region. Before returning to Cape Town for some last minute gift buying and your flight back home. After all this activity you will slowly wake up one morning feeling refreshed, rejuvenated, your pulse still racing from the sharks, your eyes blurred from the wind screaming past you during your bunjee jump – or was that yesterday's night out on the town? And you will come to the realization that you’ve had the time of your life! All the above is just a taster of what you can totally enjoy while on a holiday of Cape Town, Hermanus and the Western Cape with Percy Tours. At Percy Tours, we put all your personal travel needs first. With this in mind, we pride ourselves in offering you huge flexibility to your holiday and travel wishes. Percy Tours specialise in designing and organising completely tailor-made, personalised and individualised tours, activities, accommodation and transfers, so we will create your holiday schedule to be rammed full with 100% of what you desire for an excellent and highly memorable holiday of the Western Cape region.